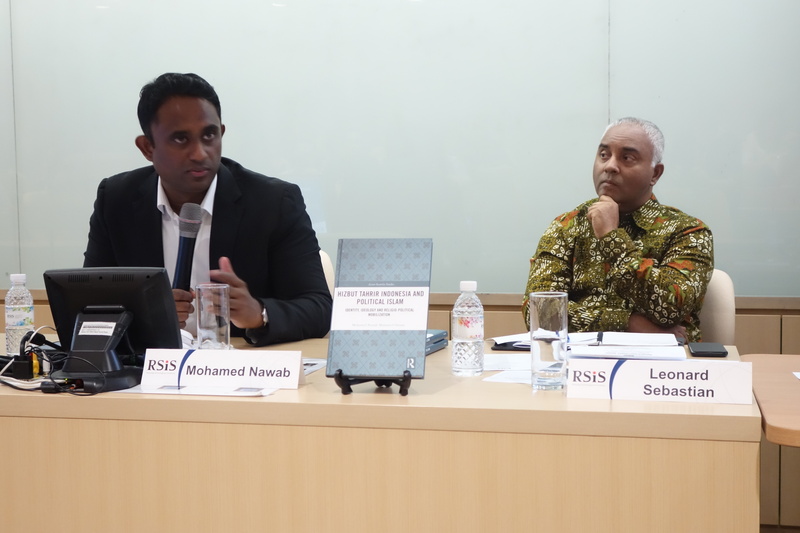 On 27 July 2018, Mohamed Nawab Mohamed Osman, coordinator of the Malaysia Programme at RSIS, introduced his new book, Hizbut Tahrir and Political Islam in Indonesia: Identity, Ideology and Religio-Political Mobilization, at an RSIS book launch event. The book is the result of extensive fieldwork and research he carried out in Indonesia between 2009 and 2015, during his pursuit of a Doctoral Degree at the Australian National University. In the book, Dr Nawab explores the key factors that have led to Hizbut Tahrir Indonesia’s phenomenal growth and increasing religio-political influence in Indonesia. RSIS Executive Deputy Chairman Amb Ong Keng Yong began the event – which was attended by more than 40 guests – by delivering welcome remarks. This was followed by a panel discussion on the impact of Hizbut Tahrir globally and in the Indonesian context featuring world-class scholars on the subject – Prof Emmanuel Karagiannis, as expert on Hizbut Tahrir; and Prof Martin Van Bruinessen, one of the foremost experts on Islam in Indonesia. In the discussion, Prof Karagiannis examined Hizbut Tahrir within the context of the worldwide diffusion of political Islam. Prof Bruinessen set the discussion of the book within the context of the growing influence of identity politics in Indonesia, and analysed the ban of Hizbut Tahrir Indonesia and its potential impact on the upcoming 2019 legislative and presidential elections in the country. All in all, the publication of this book is timely not just because it is the first comprehensive study of HTI Indonesia, but because it’s being released at a time when Indonesia is undergoing some significant changes. Groups such as Hizbut Tahrir Indonesia and its offshoot—the Forum Ummat Islam (FUI)—were behind the anti-Ahok rallies which saw the then governor of Jakarta, Basuki Tjahaja Purnama, defeated at the polls despite his high popularity rating. As such, this book is a timely contribution for us to better understand groups like Hizbut Tahrir. On a separate note, former director of IDSS and Dean of RSIS Barry Desker, in his closing remarks, mentioned that despite its growing importance and influence in Southeast Asia, literature that specifically discusses the discourses and practices of Hizbut Tahrir as a successful religious movement in Indonesia is remarkably scarce. As one of the few scholars who has pursued this subject, Dr Nawab’s incredible effort in carrying out the intensive empirical research and locating it in broader conceptual fields of the study of political Islam and social movements largely to the filling of that academic gap.